The creature, which is called Jaekelopterus rhenaniae, would have paddled in a river or swamp. Overall, the estimated size of the animal exceeds the record for any other sea scorpion (eurypterid) find by nearly 50cm. 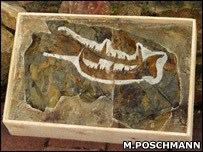 It was one of Dr Braddy's co-authors, Markus Poschmann, who made the discovery in the quarry near Prum in western Germany.